Our selection of products is designed to protect, moisturize and nourish DRY skin types. Includes Day Gel, Facial Renourisher and Hydrosol. Day Gel (Dry Skin): Our Day Gel moisturizer for dry skin types incorporates the soothing effects of Aloe Vera gel combined with Avocado, Hazelnut and Wheatgerm fixed oils. It also has the balancing pure organic essential oils of Lavender, Patchouli, Carrot Seed, Sandalwood, and Geranium. It was originally created for men due to its soothing, non-greasy texture, which is not typical in creams. However, we found that women love it as well because it gives a smooth finish and makes an excellent base under makeup. For best results, mist first with Dry Skin Hydrosol and apply only a small quantity of the gel. Facial Renourisher (Dry Skin): This is a concentrated, rejuvenating moisturizer for dry, tired or mature skin. An excellent boost of nutrients from the fixed oils of Rosehip Seed, Almond, Carrot, Sunflower and Borage along with the pure organic essential oils of Orange, Carrot Seed, Frankincense, Geranium, Patchouli, and Rose. For best results, mist first with Dry Skin Hydrosol and apply several drops and spread over skin. 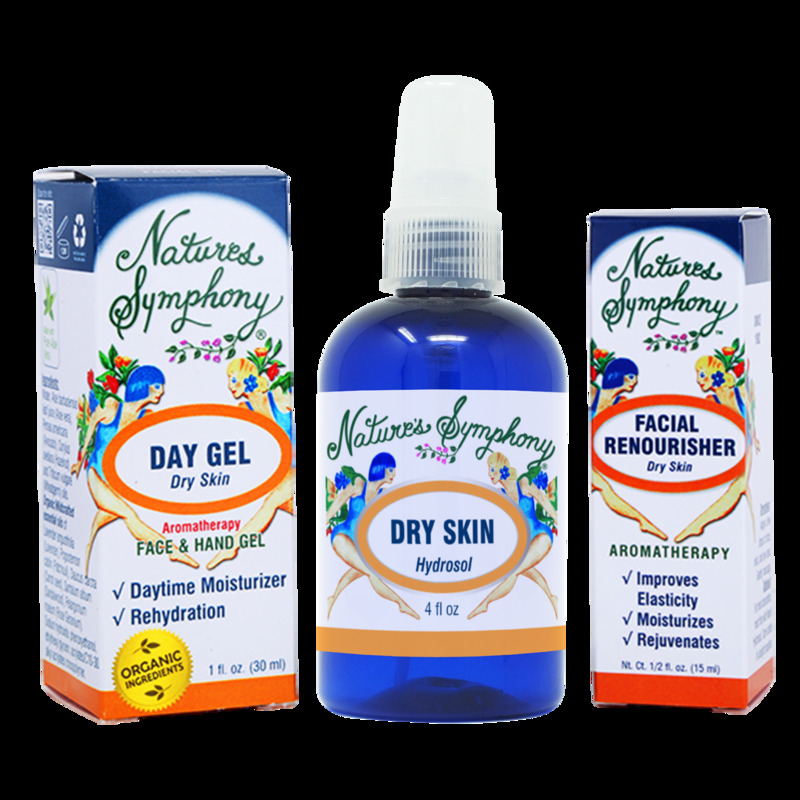 Hydrosol (Dry Skin): A gentler alternative to essential oils that renourish and hydrate your face and body. Mist face and body after cleansing or use to refresh during the day or before applying Facial Renourisher. Contains distillation water from the aromatic plants of Neroli, Lavender, and Geranium.